Anybody that had just bought the US market index would have done spectacularly well. Similarly, my portfolio has "rode the wave" upwards. Higher prices are good for the overall portfolio value but it is terrible for an investor who is trying to accumulate more shares. I have not added many new positions in the last 30 days. Below is a distribution of my portfolio's positions. The size of the rectangles indicates how large the position is. The sectors are color coded in different shades. In terms of jumbo positions, my largest ones are tobacco Altria and Philip Morris, then Johnson & Johnson, Home Depot, Visa, Becton Dickinson, Pepsico, NextEra Energy, Realty Income, and 3M. These positions were small positions but after adding and growing over the years they are now 5-digit positions with some spitting out 4-digit dividends a year. Although these positions are larger than the rest, the largest two only are around 8% of my portfolio's total size. I aim to make my portfolio as diversified as possible to prevent risks to the overall dividend if something terrible happens to a particular company. The victory runners in my portfolio are are a lot of healthcare companies like JNJ, ABT, SYK, and BDX. Surprisingly MDT is not doing well despite having a very good business. In addition to healthcare, utilities have been a horse with names like NEE and WEC leading the pack. McDonald's is never ceasing to amaze me, but at this point I think it has become extremely over valued and the chart is starting to look parabolic. Visa and MasterCard are also doing fantastically well, as shown by their earnings and extremely successful growing businesses. Industrials also lead the pack with my positions in ITW and 3M and GD climbing higher. On the technology side, my position in ADP is also doing very well. Although retail is suffering, my holdings in ROST and TJX are holding up to the beating since they are still growing incredibly well. Home Depot continues to perform like a champion. On the more disappointing side, consumer staples companies are not doing as well. The revenue growth is stalling in a lot of large companies like PG, KO, CL, KMB. The earnings from PM were not so good even with the weaker dollar. The food companies have also been selling off such as GIS and KHC. Frankly, consumer staples is my favorite sector and with the prices coming down I am getting tempted to buy several of these names even if my positions in staples is heavy. I am looking at names like KMB, PG (needs to fall more), PEP, CHD, CLX, MKC. I would like to see GIS at 4% before I buy and KHC at 3.7% yield before adding more to those two. Although these types of businesses are seeing challenging growth environment, I believe this will be temporary and eventually things will continue to operate like they have for the last 20+ years. 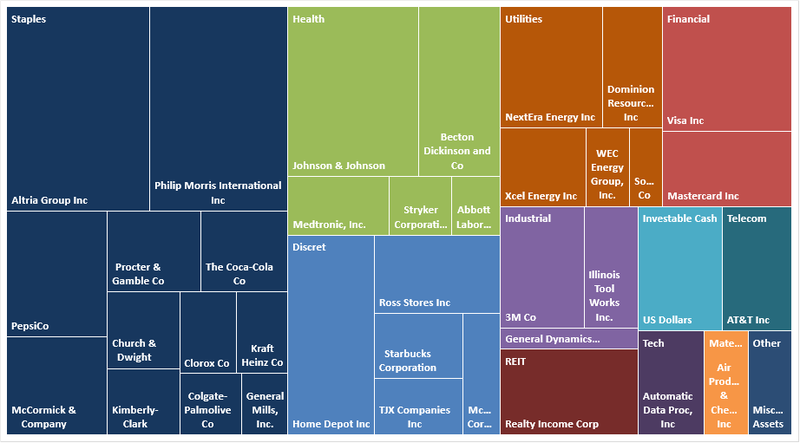 All of the consumer staples companies that I own have safe dividend payout ratios. Nearly all of them are dividend aristocrats with strong balance sheets and credit ratings, growth will not be like a Visa but the income yield is large compared to other sectors and stable. There were little to no activity in the last month or so, besides reversing the tax loss harvesting temporary position. BTI was a temporary tax loss harvest position for MO. I sold the $12k in BTI and bought back the $12k in MO. Core positions below are colored in Green. Supporting is Yellow and Speculative positions are Red. I also color code the company's financial credit rating and safety levels on the right columns. 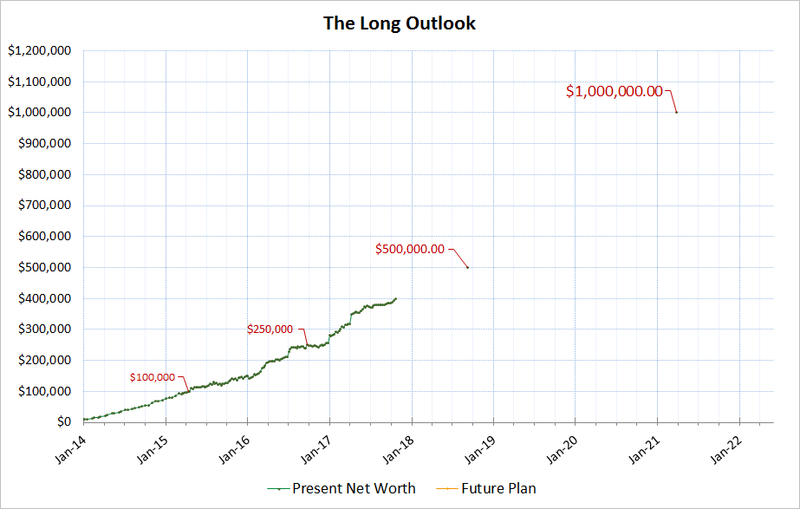 The goal of this portfolio is income replacement. All positions I own must pay me cash in the form of dividends. All dividends are reinvested back into the company that paid them. When purchasing companies, I aim to buy only the highest quality companies (financial credit rating is very important to me) with an established track record (consistent earnings and dividend increases) even during economic recessions. My biggest goal is ensuring the safety of that dividend and the growth of that dividend. One day I aim to live completely off the dividends alone. I've gradually tried to decrease my overweighting in Staples. I have tried to expand my positions in the Utilities and Healthcare space as well as Industrials. Since many stocks are very expensive right now, it is hard for me to find good value. The companies that are cheap are ones that are not doing well at the moment and I am not a fan of bottom fishing or buying lower quality companies on the cheap. My portfolio is currently flirting with the $400k level. My goal at the start of this year was to hit $400k by year end. There is still 2 months and a week left before the end of 2017, so I think I have a good chance at hitting my goal for this year. I must admit, the $500k goal in 2018 looks ambitious, I set that there thinking that my money will start doing some work by itself instead of me doing all the heavy lifting as seen in the years of 2013-2016. If I don't make my dollar goals, it doesn't matter much. My main goal is not my portfolio's paper value but instead the dividends it can spit out. Investing is not a sprint but a marathon. As long as I continuously invest money into income generating assets, my goals will be achieved one day. At this time, my portfolio is spitting $10,146 in annual dividends. In terms of dividend hikes, I recently got news from Visa that they are hiking their div by around 18%. What a champion. Additionally, McDonald's has increased their dividend by 7.45%. Burgers and junk food is definitely still "in". Right now I'm only waiting for Starbucks and BDX to announce their dividend hikes for this year, and all of my positions will have raised their dividends for the year of 2017. 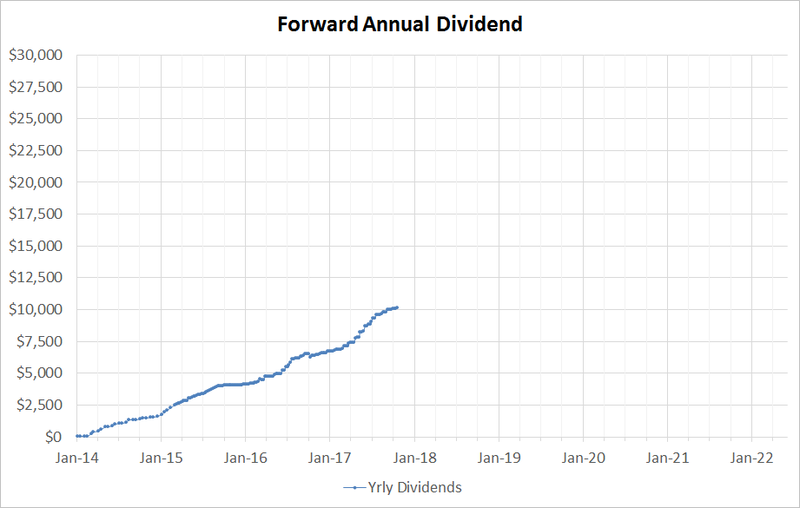 If you average all of my positions that have hiked their dividend this year so far, I am averaging around 9% of dividend raises which is fantastic. The portfolio is looking good, YD. That average dividend raise of around 9% is awesome. Almost $400K total, over $10K annual dividends... terrific work. With the steady climb on those graphs, it's only a matter of time before you reach your goals. Great portfolio and great analysis. Dominion gave us a small and somewhat unexpected dividend increase to paid in December at 77 cents, a 2% increase. Given their stated goal of 10% annual dividend growth, I expect another increase for the 2018 payments. Any thoughts on what this change in the timing and amount of their announcement might mean? Yes I remember the 2% from D, I forgot to write it down. It is odd they announced before the 4 quarters of 0.755 dividends were paid as they usually wait a full year to finish before announcing a hike. I think they will announce like you said a 8% hike sometime in March 2018 to complete their goal of 10%. To me, I didn't read anything special from their change in announcement period. I just collect the increased dividend checks and be happy with it. Portfolio looks good! You say you're looking to expand in healthcare, industrials, and utilities. Is there a reason you aren't looking to expand / add to your REIT positions (like O, OHI, etc.) as well? I'm not a big fan of REITs because of the high debt and the way they dilute their shares to grow. Since REITs pay out nearly all of their earnings to shareholders as dividends, they don't have much money left for themselves to grow. So to grow and buy new properties they open debt or do public offerings of more shares. I prefer the normal C-corp type of businesses. Love the chart and congrats on being over $10K in forward dividend income, that was my goal for this year. I recently crossed the $300K mark and am upset by how much the market keeps riding up, kills the dividend investing momentum haha. I agree on GIS - with a small growth rate this year, they need to have a yield > 4% for further consideration, so room to fall there. If PG drops in the $85 range, they are going to be worth looking at, so I would have a warm welcome for that decrease as well.